"The perfect squelch" was a popular concept in the 1950s. I know because I've seen it in a few different magazines from that era. In fact, The Saturday Evening Post ran a regular inset feature by that name. As you might guess, it has to do with making a short statement that has the effect of cutting out the 'noise,' whether it be from the background of a radio reception or from an obnoxious person shooting off his mouth (which was the case for the SEP). BTW, the "Squegg" part of Sunspot McSquegg's name comes from the radio term 'squeg,' which refers to oscillations due to excessive feedback, like what happens when a microphone is placed too close to the speaker. See also "Written in the Stars" by Rod Newkirk. Yes, it was more than enough to drive a self-respecting DX man to tears. Sunspot McSquegg, our club's hottest propagation prognosticator, was mad enough to eat the poly off his ethylene. You see, Sunspot had finally gotten his fill of Earlybird Kilroy, the "sleepless wonder" of our gang. 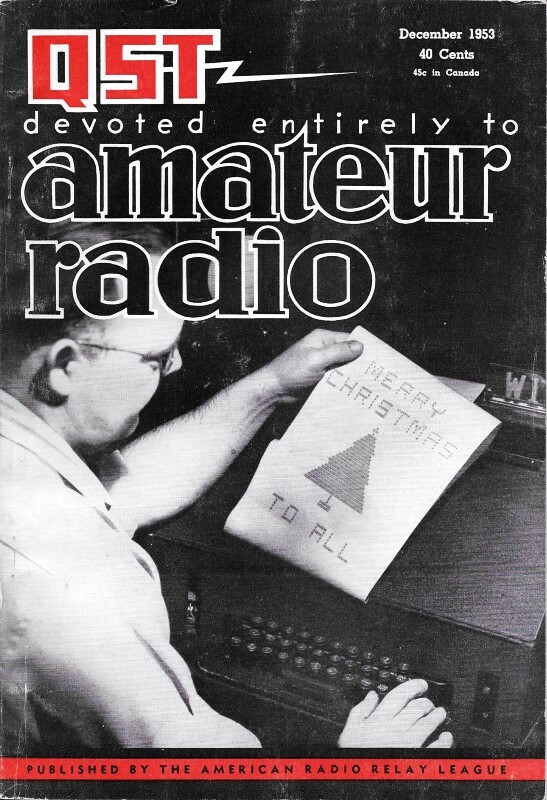 No matter what the boys would work, when they casually mentioned it at a meeting Earlybird would reach into his vest pocket to produce the perfect squelch - a bona fide QSL from whomever the subject of conversation might be. Or, if that weren't possible, Earlybird would knock the ashes off his cigar with a flourish and remark, "Oh, you got 'im, too!" Moreover, DX was just one of Kilroy's fields of victorious endeavor. Take the annual bargain sale at Gimple's Radio Supply, for instance. By the time the rest of the club got downtown to the counters, Earlybird was already on the way home with his station wagon full of 27-kc. i.f. strips, surplus high-torque radar rotators, et al. The stuff he left behind for us wouldn't have looked respectable in a brand-new Novice's junk box. Sure, we could deal with Kilroy for the good items he picked up, but brother, the bargain sale was over. And under all such triumphant circumstances the guy was insufferable. 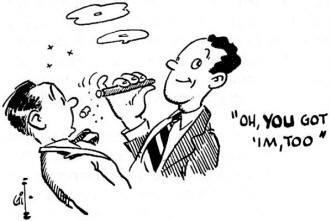 His overbearing air of omnipotence was exceeded only by the overwhelming stench of his cigars. But when Kilroy put the damper on McSquegg's 7-Mc. AC5 contact it was the last straw. Sunspot determined to do something about the situation and dug into the Call Book for the rarest listing he could find. He settled on ZD5HI, whom he was positive had never been active, and began writing letters. Letters and more letters. 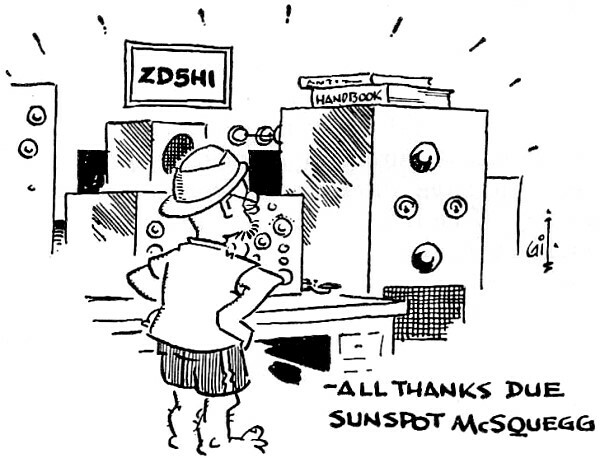 Subsequently, Sunspot sent the ZD5 a high-priced 14-Mc. rock. He sent him a Handbook. He sent him a new rig and a hot preselector. He sent him this. He sent him that. As an added token of their friendship, McSquegg even shipped the fellow a complete library on the subject of single sideband. Verily, inside of two months ZD5HI must have accumulated the paradise station of the Indian Ocean, all thanks due Sunspot McSquegg. Our hero had the propagation aspects all figured, too, for that was his forte. And not only was the sked a sure thing but it was timed shrewdly to coincide with archrival Earlybird's inevitable daily dog-walk. Sunspot McSquegg visualized a most merry Christmas - times ten! And, brother, wait until he cornered Kilroy soon thereafter! The fateful Christmas morn arrived. Sunspot jumped out of bed before the kids, humming a pleasant Hit Parade tune - "Mine, All Mine" - and rubbed his hands. A bar of "Good King Wenceslaus" and zero hour was at hand. The 866s cast an intermittent bluish glow in the dawn's dim light; a few moments later he was working ZD5HI c.w.-to-'phone. Eureka! A glance out the shack window revealed that the plot was proceeding according to plan. In the snows outside, Earlybird Kilroy was being dragged reluctantly along by his cocker spaniel. And, as usual, over the countryside far and wide hung the asphyxiating pall of Earlybird's morning stogie. The set-up was perfect! Sunspot was penning "Glad to be your first W" on the bottom of an airmail-special-registered QSL card as ZD5HI started his final transmission. McSquegg could sense the impatient W/VE crowd getting set to open up on ZD5HI with a salvo sufficient to outclass Big Mo. It was then that the accented voice in the 'phones literally reached out and knocked him off his chair. "A distinct pleasure to work you, Sunspot," said the rare fellow. "Delighted to be your first ZD5. And, by the way, please remind yaw' club friend, Earlybird, that he still owes me a QSL for our 160-meter single-sideband QSO of last week. Very seventy-three!" Sunspot grabbed the window sill and pulled himself up off the floor. He dejectedly watched Earlybird and his cocker as their figures perspectively grew smaller and smaller in their journey down the lane, realizing then and there that he had fought a futile battle against hopeless odds. 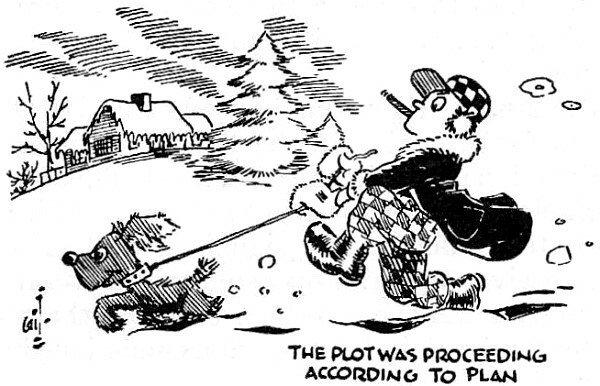 Wheezing from the still-hovering fumes of the lethal cigar, McSquegg's own sad-looking hound, Fleabait, disconsolately wandered out through the front gate to sniff the cooling tracks of Kilroy's dog - pawprints in the new-fallen snow proclaiming to all the world that Kilroy, indeed, had been there.